Severe weather can strike at any time, day or night. You may not be listening to broadcast radio or watching television when a weather alert is issued. But you can keep informed of changing weather conditions by keeping a NOAA all hazards weather radio in your house. An external antenna can increase your reception of NOAA weather broadcasts. Weather radios monitor the seven radio frequencies that the National Weather Service uses to broadcast weather information, current conditions, and severe weather alerts 24 hours a day, seven days a week. There are over 900 NOAA weather station transmitters covering almost 95% of the United States. But there may be locations, especially in rural areas, or in hilly or urban terrain, that may not reliably receive the NOAA weather broadcasts. If that is the case for your location, then an external antenna may be needed to reliably increase the reception of NOAA weather broadcasts. 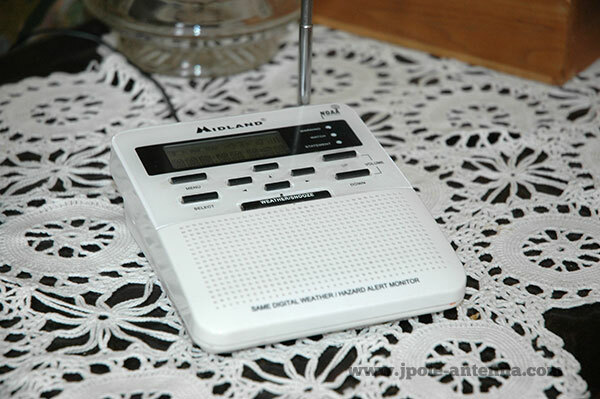 Most weather radios, like the popular Midland WR-100 pictured, have the ability to be connected to an external antenna. If you look at the back of the weather radio, you’ll see a small port marked Antenna. The NOAA weather J-Pole antenna is a great choice for these radios to increase your range and strengthen reception. The weather radio has an RCA jack on the back, so you will need a couple of additional parts to connect the radio to the antenna. But everything you will need is available from your local Radio Shack store. 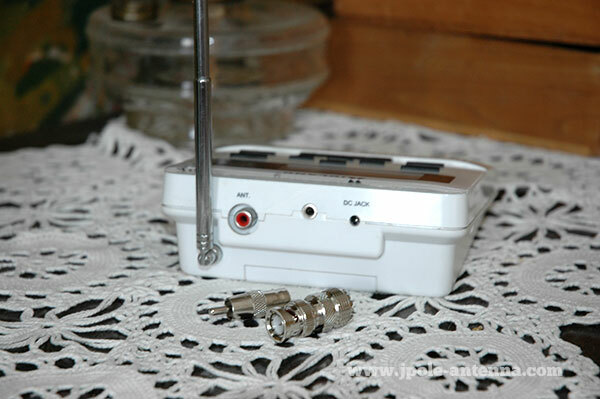 To connect the radio to the antenna, connect the two adapters inline and insert the RCA male end into the jack on the weather radio. Run the coax cable (either the 20 or 50 foot length, depending on the length of your cable run) to the antenna mounted outside. One end of the cable is attached to the adapters and the other to the antenna. Seal up the exterior connections with high quality electrical tape. Need an external antenna for your weather radio? Check out the NOAA weather J-Pole Antenna. Once the external antenna is connected, go through the available frequency channels and program to receive the strongest/closest channel to your location. You will probably be able to pick up more than one channel with the new antenna, so you will want to make sure you listen to the channel that is broadcasting information for your location. That’s all you need to do, now you’ll never miss an important weather alert. You are absolutely correct. You should follow local building codes and ordinances (including the National Electric Code) when installing antennas. I don’t mention that in this article, but I do have an article that does go into a little detail on properly protecting your antennas and equipment from lightning strikes. Great question. The antenna has a mounting section at its base that is about 11 inches long. You can attach the antenna to a mast or other support structure with the use of a couple of hose clamps or U-bolts. Interesting. I try to maintain code, but for an application such as this I wouldn’t worry about lightning protection unless you have this antenna way high and/or separated from other lightning-attracting materials. Incidentally, grounding is what attracts the lightning in the first place… And having my house struck *twice* in two years, I’ve learned it really doesn’t matter what you do to protect except unplug everything. So in the event that your antenna here gets hit… it is extremely *unlikely* that the surge will go past your radio as it will likely burn out any bridges to your home electrical system. Indeed, if your antenna is hit, the bolt likely split and arc’d to your electrical anyway (since it also has a nice yummy strong ground to earth as well as one to your local power company via the neutral). Bottom line… codes for lightning are useless and ineffective if you are actually hit. Nothing man-made will stop the damage and power. 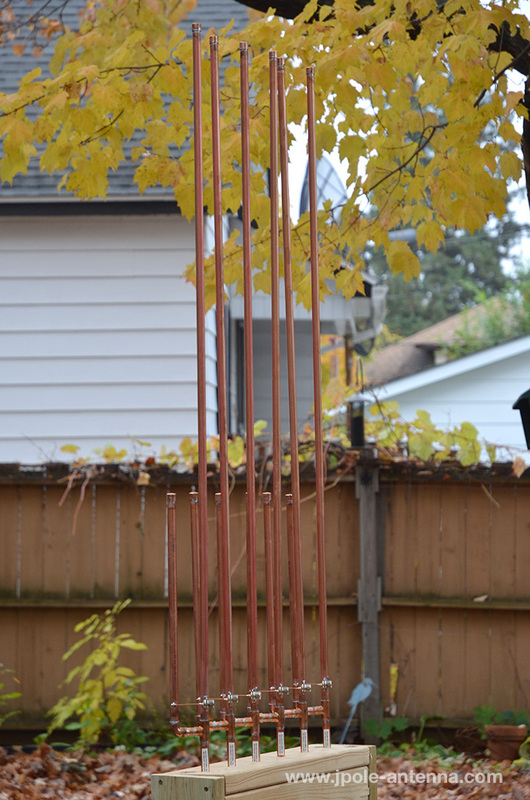 The fewer grounding rods you have (you only need one), the better off you are. Just my experience, your mileage may vary. As for places to mount… for NOAA radios, I just read that you can use your TV antenna. Since mine’s mounted in the attic (2 of them actually, with signal combiner)… I’m going to try that route since all the cabling is done. I just have to split at the closest TV antenna hookup and see if it works 🙂 If not, I’ll try a J-antenna up in the attic and see how that shakes out.